My name is Brandon, owner of BecomeaRideshareDriver.com, and I will be your personal Uber Driver Coach. I’ve never been a big fan of working a 9-5 job. A lot of people look at it as security, but truly nothing is secure. Even the best people have been laid off, while other people lost their jobs because a once big company went Bankrupt and out of business (Circuit City, Blockbusters, Enron). So, instead of working a 9-5 my whole life, I decided I’m going to become my own boss. While I’m not going to say driving for Uber will make you rich, it does give you the freedom to work whenever you want as much as you want or as little as you want. Maybe you already have a decent job and you are just looking for a little extra cash so you can buy that new T.V. or take that vacation to Hawaii. Whatever it is Uber has helped me out a lot. I have been driving for Uber since July 2015 and it has managed to pay my bills while allowing me to spend time with family and friends on the holidays and special events like weddings and birthdays. I’m a people’s person, so I have always loved having the different types of people get in my car. While you do have some buttheads out there, for the most part, my experience has been great. The different kinds of conversations I’ve had, even new friends made along the way. Not only that, I’m grateful for what Uber has done especially in times of economic struggles. Many people have been able to work again allowing the economy to rise. Some may argue that, but I’m sorry I would disagree with you. Uber has made it more affordable for the consumer to get home when they don’t have their own ride, and even DUI’s have been decreasing since Uber appeared. It’s estimated that cities that have Uber have decreased Driving Under the Influence by 10%. So, not only are more people making money with Uber, lives are being saved with access to this technology. How could you go wrong with that? And for those that are going to ask; Yes, currently Uber is my only job. I live by myself in what I like to call a “mini-house”. Really it’s a studio apartment but detached from any actual house. Part of the reason I do Uber is, once again, having the freedom to work whenever. Because of that, I have been able to focus on building a business online. Pretty much making websites like the one you are on right now. Uber allows me to have the time to do this as well as pay my bills until my online income skyrockets. 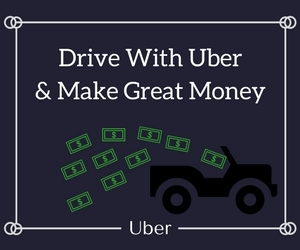 And, since Uber has helped me out a lot; I decided I would design this website to teach you How To Become An Uber Driver so you can have some freedom to pursue whatever dreams you are aiming for down the road.